Grosgrain: No Sew Plastic Tablecloth Streamer Ideas! No Sew Plastic Tablecloth Streamer Ideas! Loved these ruffled streamers made from simple $1 plastic party tablecloths via Cupcakes and Cutlery. Just cut tablecloths into strips and rub the edges with your finger and thumb (while folded to go faster) and voila, beautiful ethereal decorations. Get the full how to at Cupcakes and Cutlery! Also....Love the look of hanging streamers but couldn't imagine investing the time to unravel, cut and tape each piece? 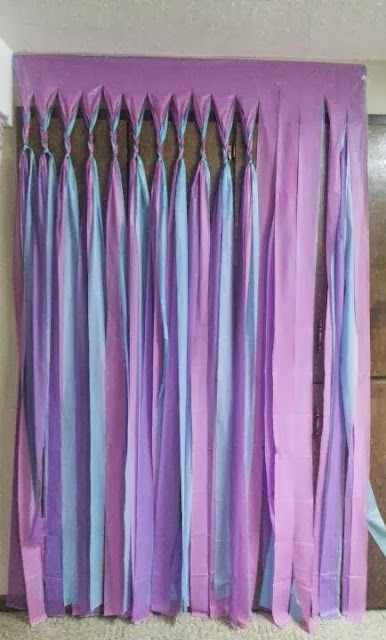 Try this quick and easy tip: Hang Several layers of plastic table cloth to a door opening. Cut into strips, braid the tops and leave the rest hang. I couldn't find a source for this image so if you know of it please let me know!